"Yet, a teacher’s complaining abut the students’ characteristics is like a chemist complaining about the physical properties of elements. The students are who they are now. " The crayon scale starts at 50 for every class. It moves up if they're working nicely and down if they're too goofy or loud. If it goes up to 100, they earn a crayon in their class' crayon box. If it goes down to 0, they lose a crayon. 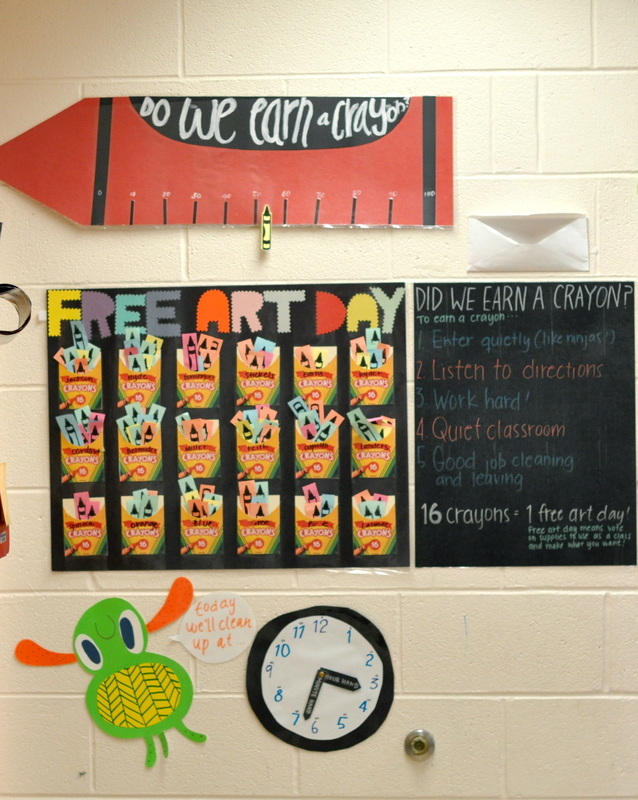 If a class earns 16 in their box, they earn a free art day! The crayon scale is just a large construction paper and the pointer crayon is just a paper crayon stuck to a clothespin. I laminated the crayon boxes and used a knife to cut the rounded opening. This way, I can re-use it by using an Expo marker to write teachers' names on each box. There is a "timekeeper" job for each class and they ask me when they clean up that day and change it so no one has to ask how much time is left in class. My tables are each labelled with a color and when they start clean up, I take down the colored circles on this chart (laminated with velcro on the back). A lot of students start reacting to the sound of velcro ripping. When a table is all clean and all doing the Mona Lisa (below), their color goes up. If they start talking again, their color comes down. I talked about this painting on the first day with each class, and now when I say, “show me the Mona Lisa!” they fold their hands, sit/stand up straight, close their mouths, and smile. Sometimes I give stickers to the best Mona Lisas and students who aren’t doing it will catch on and try their hardest to earn a sticker. It's a good attention-getter to get them to be quiet and listen when you need to give directions. I ordered the poster from Amazon for around $3 and laminated it at school. 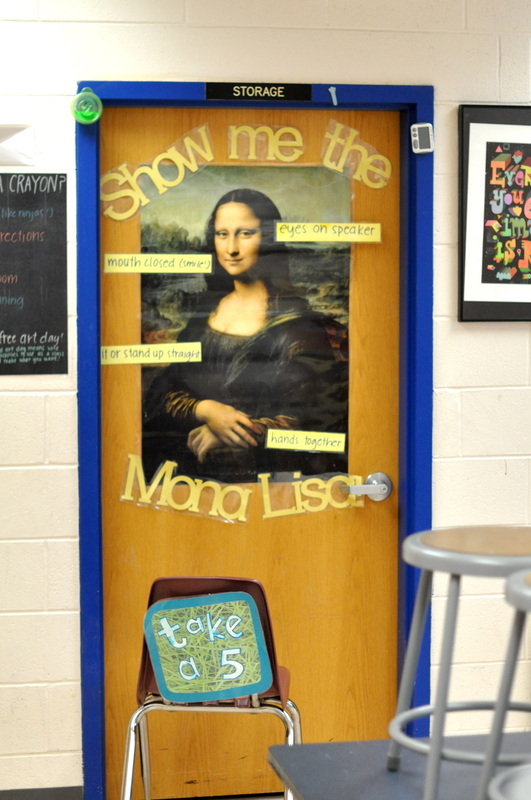 I picked up the Mona Lisa thing from an in service in Philly while student teaching when a teacher said she used something like this in her room. It works very well with my k-6 crowd! Students can get counted for not doing the right thing. After 3 counts, they take a quiet 5. They set the timer, sit for 5 minutes, then return to work. The art traffic light shows the colors spelling "art". If a class as a whole is too loud or not following directions, I will flip over the T which gives them a warning. 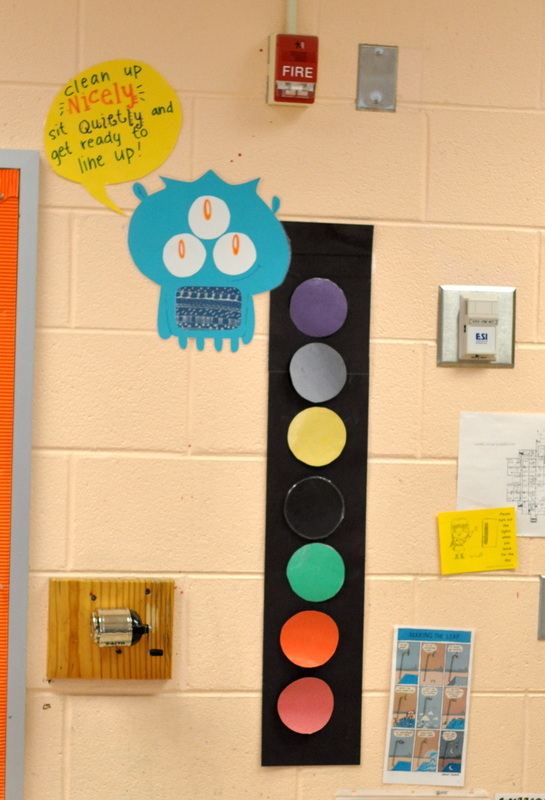 If the noise/behaviors continue, the yellow light will change giving them 5 minutes of silent art, and if they still cannot contain themselves, the red light will change giving them silent art until the end of class. With the 5 minutes, sometimes I will add time if someone talks. I say, "Oh, thank you (student name), now we have SIX minutes of silent art!" and that gets them to stop. If it's really bad, I start giving time outs to people who are talking and usually older kids take them in the pod outside my room with a think sheet which their teachers and parents see/sign. I used this app a lot my first and second years of teaching, but do not use it anymore. The Pro version is $2.99 and was totally worth my money with some of the older kids I had in my classes. I set it so that the most annoying alarm from the choices goes off (on my speakers) and the screen turns red and displays a cracking effect when they are too loud. You can set how sensitive the sensor is. For every X minutes they are quiet (you can set the X to how ever many minutes you choose), they can earn a star. I set up incentives for if they can get to 10 stars in one class with one star earned every 5 minutes. You can set it so that they lose a star if the alarm goes off, but I didn’t do that. Some classes got extra incentives like being able to switch seats if they got a certain amount of days with 10 stars earned. A few of the guys in the first class I tried it with had too much fun setting it off on purpose so I set an automatic time out consequence if they do that since it’s not fair and makes everyone else mad! I've used this with both gen ed and special ed populations for children who really need an incentive to work well in art. It says "he" since I've only used this with boys, but I left room for an "s" if I have to use it with a girl some day. 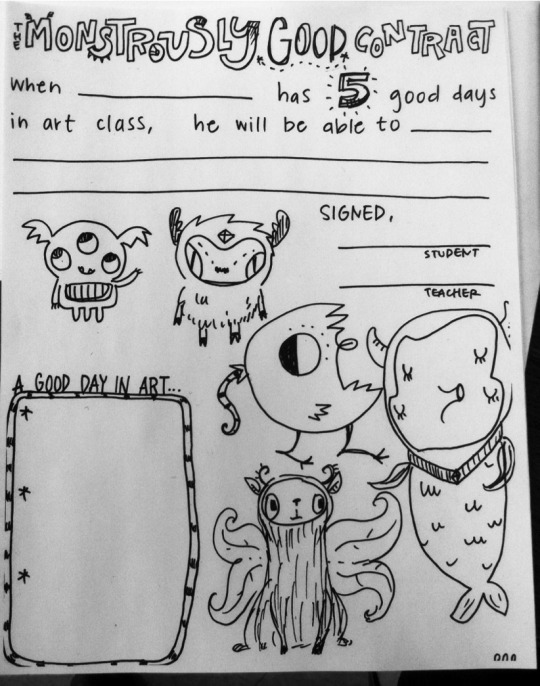 Together, the student and I decide what a "good day" in art means for them such as no time outs or finishing work and decide on an incentive. We both sign it and a copy is sent home to parents. Each time the student has a "good day", they could color in a monster, and when all monsters are colored in, they get their incentive.